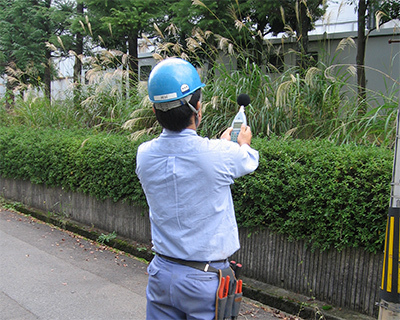 Fukuvi Chemical began its energy conservation efforts and environmental management program in 1997, and since then has made great strides in these fields. 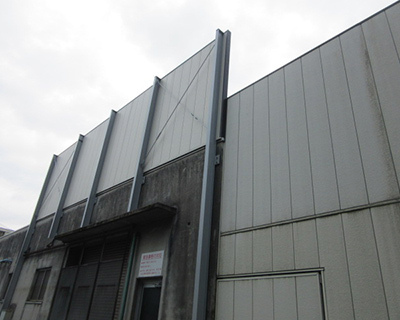 Fukuvi has two plants designated as “Type 1 Designated Energy Management Factories” under Japan’s Energy Conservation Law, as well as receiving a company-wide certification for conservation efforts. Energy conservation efforts are not only required by law, but are also an important responsibility for us as a company, so we continue to make energy conservation one of Fukuvi’s top priorities. Reducing greenhouse gas emissions is an important issue facing our planet. Carbon dioxide produced due to energy consumption is a predominant factor in greenhouse gases. To combat this, Fukuvi Chemical is continuously striving to reduce our emissions through energy saving initiatives. It’s not only important that we reduce our emissions as a manufacturer, but also that we design products which can reduce emissions in the homes where they are used. Therefore Fukuvi is always creating innovative new products which can make our homes both comfortable and environmentally friendly. While updating our facilities and equipment is crucial to energy conservation, it is also important that we increase our employees’ awareness of energy conservation methods. Making sure our employees know how to properly handle equipment utilizing pressurized air, steam, and heat can greatly contribute to energy conservation. We lead seminars for our employees to educate them on proper usage of this equipment as well as other methods of energy conservation. 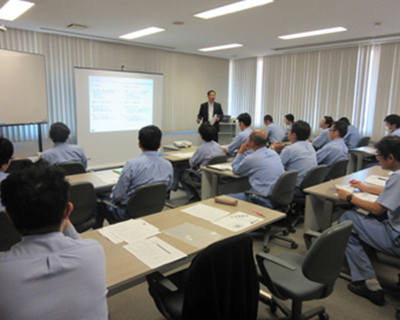 Fukuvi strives to not only update our equipment, but also change the mindsets of our employees to be energy conscious. The manufacturing process can produce a lot of waste, so recycling is of key importance for manufacturers. 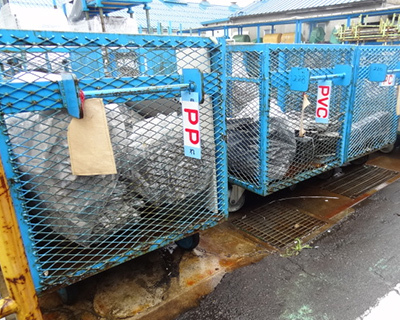 Fukuvi Chemical is not immune to this, as the production of plastic products can lead to a lot of waste material. At Fukuvi Chemical we use a variety of plastics with different properties that can give our plastic products different capabilities. Therefore we have developed a sophisticated sorting system for our plastic waste, ensuring that it can be recycled effectively and eliminate waste. 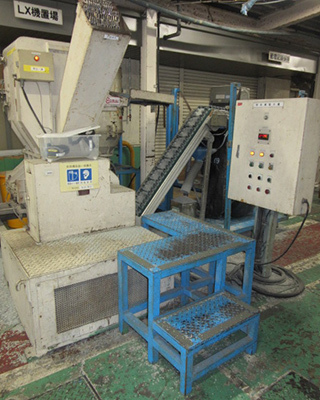 Plastic crushing machine: This machine takes the sorted scrap plastics and grinds them back into usable raw materials. 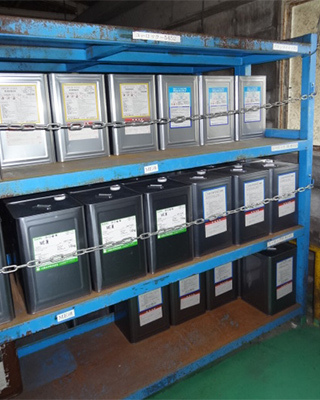 Fukuvi Chemical uses many different chemicals for research and manufacturing. In order to protect the environment, we strictly manage our chemical use and storage so that nothing will leak or cause damage. Additionally, we have strict guidelines pertaining to the handling of any combustible chemicals, and have firefighting equipment on site and proper procedures in place to handle any emergency. 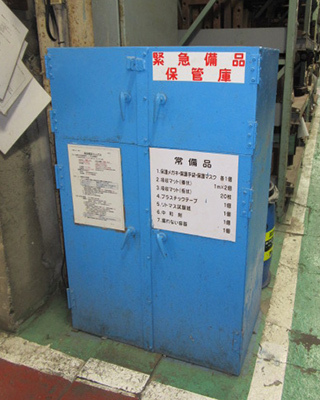 Hazardous Materials Storage: Materials are securely stored so they won’t spill or leak, even in the case of an earthquake. 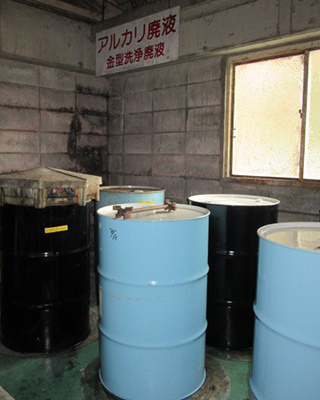 Chemical waste management: Hazardous waste is strictly managed and confined until it can be properly disposed of. Leak Prevention Emergency Response: In the unlikely event of a spill, we have procedures in place to quickly clean and contain the chemicals. Fire Prevention: We have large scale water tanks in place for the unlikely case that a fire occurs. 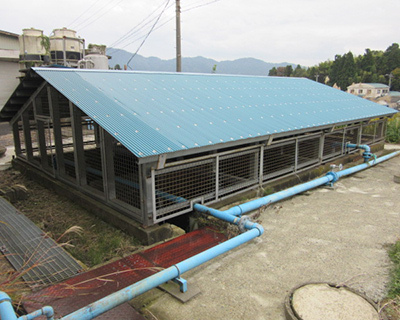 Fukuvi Chemical strictly monitors its drainage and smoke emissions so that they will not affect the local environment. We also ensure that the noise and vibration generated by our factories will not disturb the communities around our facilities. Fukuvi is committed to being environmentally friendly and is making continuous efforts to improve our sustainability efforts. 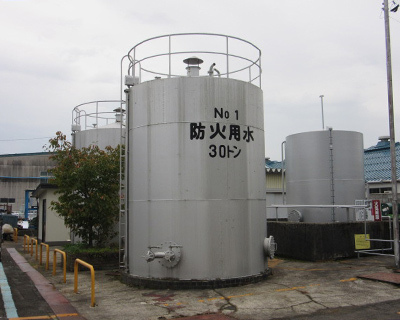 Fukuvi Chemical has many environmental management systems in place, and is continuously working towards improving our environmental efforts. Amongst our environmental management systems we follow the international standard ISO14001 system, which we were certified for in 1999. Since then, we have maintained this certification, and are diligently monitoring the effects of our business on the environment while introducing new systems for environmental management. 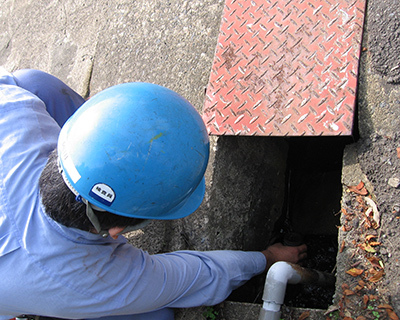 Assess ways that we can improve the environment individually. Each employee must be increasingly conscious of how their actions affect the environment, and work together to make improvements. Understand precisely the environmental effects of all our manufacturing processes, products, and services, in order to effectively use our energy and resources, work towards waste reduction, protect the environment, and preserve our ecosystems. Consider the environmental burden at each stage of our product development, including development, materials procurement, production, market circulation, and disposal. Observe all related laws, regulations, ordinances, and other requirements. Additionally watch for any law revisions and adjust our methods accordingly in a timely manner. Review our environmental management system constantly and continuously strive to improve this system in order to make environmental protection activities more reliable and effective.